Bangladesh Udichi Shilpi Gosthi held a Borsha Utsab at Bakultola of Charukola Institute, Dhaka Univesity, on Sunday, the first day of the Bengali month of Ashar. 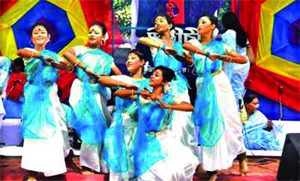 To welcome the rainy season, the Dhaka metro branch of Udichi Shilpi Gosthi organised the festival like previous years. With the instrumental presentation of Bijan Chandra Mistri, the traditional programme was launched in the morning. Renowned artist Hashem Khan, President of Udichi Shilpi Gosthi, Kamal Lohani, Ahkamullah and Belayet Hossain attended the festival as distinguished guests. Recitation and musical performance were presented by Bhaswar Bandopadhyay, Mahmud Selim, Salma Akbar, Soma Rani Roy, Azizur Rahman Tuhin, Mamun Zahid Khan, Chhaya Karmaker, Bulbul Islam, Sharmin Sathi Islam Moina, Biman Chandra Biswas, Mohiuzzaman Chowdhury Moina, Mahua Manjuri Joyita, Semanta Manjuri, Sunanda and Anima Muji Gomez performed at the event.